The hype of the smart cities is unstoppable and everybody discusses about how the technology will improve our daily life. As pioneer in the Internet of Things and Smart Cities market, Libelium offers new strategic content with a series of quick reports to bring up and summarize the benefits and characteristics that the IoT technology provides to improve citizens’ quality of life. Urban population has doubled in the last 50 years. Consequently, the organization and management of mobility becomes essential, and the benefits that the IoT solutions grant to the city managers to improve the sustainability and citizens’ demands are countless. 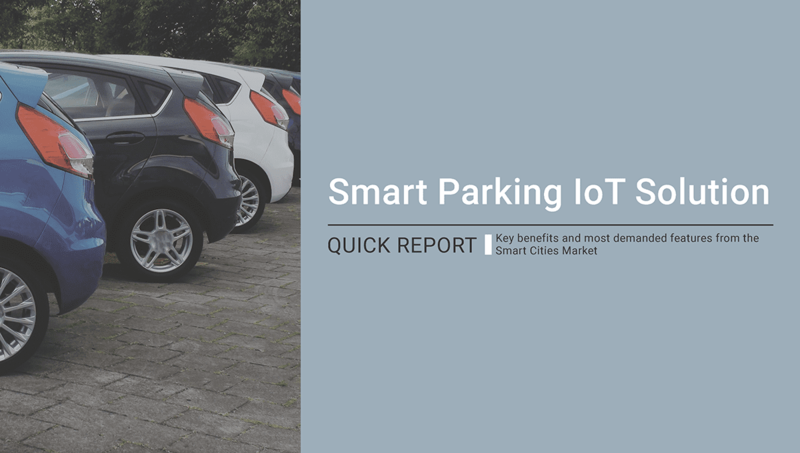 Libelium opens the series of reports with the Smart Parking IoT Solution Quick Report. The document briefly summarizes all the benefits, advantages and return on investments that this Smart Parking IoT solution provides to the urban society. Having real-time information about the state of the traffic or occupancy of the car park areas allows public administrations and private companies to better manage their resources, plan road traffic, generate access restrictions or even modify routes in order to increment the efficiency of the mobility and develop new sustainable actions. Smart Parking is one of Libelium flagships. Research and development in this vertical has been always a priority for the company, which faithfully believes in the virtues of the solution. Libelium’s Smart Parking platform has suffered an important evolution since its launching in the year 2011: its dual detection system, dual wireless communication, dual installation deployment, software and hardware characteristics made it one of the most interoperable and scalable smart parking systems of the IoT market. Related with this new quick report, Libelium recommends readers interested in smart parking solutions to review the published case study titled controlling car park areas in Montpellier (France), a project developed to take actions in order to reduce traffic congestion in the center of the city. The Libelium’s strategic focus swift from sensor devices to a more extensive presence in the whole IoT value chain, allowing the development of end-to-end solutions, facilitates the access to develop new Smart Parking IoT solutions with ready-to-deploy kits at the IoT Marketplace. Libelium’s Smart Parking platform is able to send data to many different clouds. Some of our customers are already offering their cloud services and software solutions along with our technology and different communication protocols. You can check all of them on the Smart Parking section of the IoT Marketplace. Discover our Smart Parking Kits in The IoT Marketplace.